Custom Smartphone & Tablet Stand with your custom logo printed. A great desktop item that is inexpensive but will be used everyday. 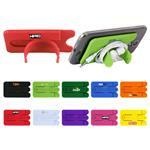 Simple ABS plastic phone and tablet stand snaps flat for storage or to use as a direct mail piece. Features a textured rubber panel to hold device in place. Large imprint area. A great low cost tech promtoional item. 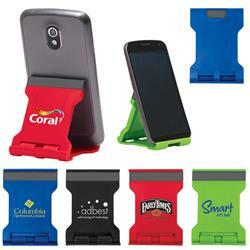 Simple ABS plastic phone and tablet stand snaps flat for storage or to use as a direct mail piece. Features a textured rubber panel to hold device in place.